We've been busy Christmassing here. For us, that means putting together packages of gift wrap makings. I find that so often, people get so caught up in buying the gifts, that they forget about the gift wrap, and gift tags and sticky tape, and ribbons. This often means a last minute mercy dash to the stores, and we all know how that ends! Frustration, fights for a car park, and likely too much money spent. So in order to make the gift wrapping process go more smoothly, we give the gift of gift wrap! These sweet tags are what are called 'luggage tags'. You buy them here at Newsagents or Stationers and they're usually 5c each. They're also available online. They're made from manilla cardboard, like manilla folders used in offices and classrooms, and this great neutral colour makes them a wonderful background for anything that takes your fancy. It's worth spending a bit of time preparing your bibs and bobs for a tag making session as the more little pretties you have on hand, the more unique and special your tags will be. Ours are never the same twice! A few days before making my tags, I spent time hand dyeing rolls of white crepe paper streamers, tea dyeing paper doilies, and sourcing interesting looking wrapping paper from $2 stores in a couple of different patterns. 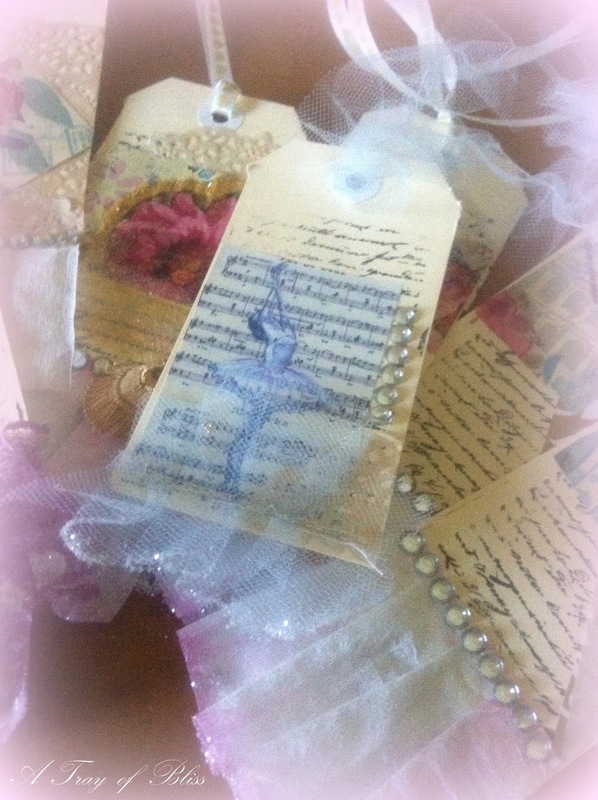 In my craft stash, I already had a French script stamp the width of the tags and almost the same length, to use as background, some diamante` stick on dots, and some pastel tulle ribbon purchased from Koch & Co, a florist supplier here in Australia. That was part of last years crafting frenzy and purchased on sale. You could also use bridal tulle cut into strips, but this just makes it easy. I always have lots of ribbons on hand so they were on standby too. There was also packets of Dylon fabric dye, that I currently use to dye muslin. As I only use a pinch at a time, there was more than enough left for this project, and some to spare. We love glitter as well, especially white or holographic glitter, so we got that out too. Of course we had craft glue on hand as well. I separated my white crepe paper streamer roll into four lengths so I could have different colours and shades. I rolled them into loose rolls. 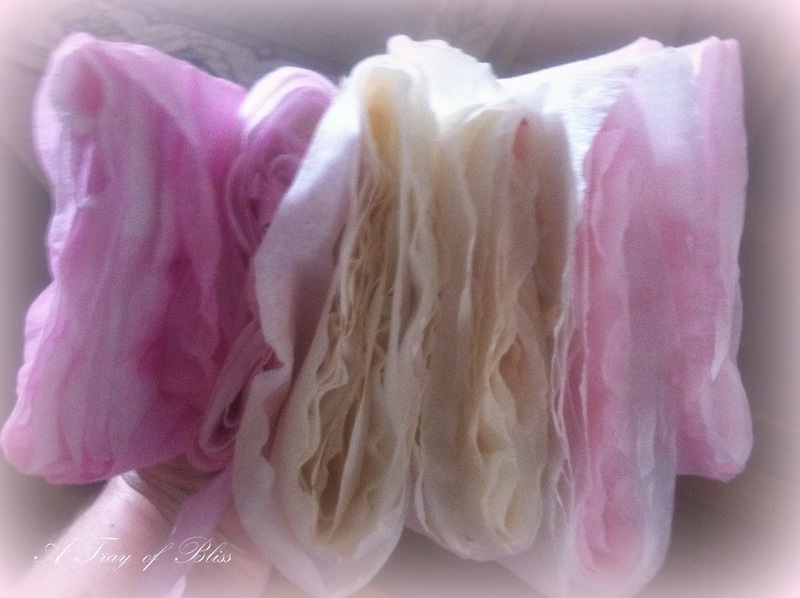 Now dyeing crepe paper is an idea I got from Annabel over at The Bluebirds are Nesting. You can see her blog over there on the right of screen. She dyes whole lengths of crepe paper and makes the most divine paper roses from them. Alas, when I attempted dyeing a whole length, it disintegrated when I lifted it from the dye solution. I must go back and read Annabels instructions again. You can see her roses and the instructions here. To dye the crepe paper streamers, I filled my stainless steel kitchen sink to a depth that matched the width of the streamer, plus a bit, with hand hot water from the tap. I added a generous pinch of pink dye powder and swirled it to dissolve the powder. I then stood two of the rolls in the water, rolled edge down, and weighted them with a large kitchen knife, so they wouldn't float. I let them sit there for maybe fifteen minutes until I could see they'd absorbed the dye, flipping them over after eight to ten minutes to get both edges coloured. This method gives a dark edge, with a more pastel effect towards the middle. I then lifted them from the water, and gently squeezed a little of the moisture from them. They'll be very fragile so be careful. And don't squeeze too much liquid from them, because that's your dye. They get set aside now for 24-36 hours to dry well. I repeated this process using a pinch of bright orange dye and the other two rolls of crepe paper streamer. This is how they looked once dry...one darker pink, one lighter pink done second, and a really delicate peach colour from the orange dye. Vary the amount of dye according to the depth of colour you'd like. Next I dyed some paper doilies with black tea. That's normal tea, nothing flash. Again, I added tap hot water to the kitchen sink, and threw in half a dozen teabags. 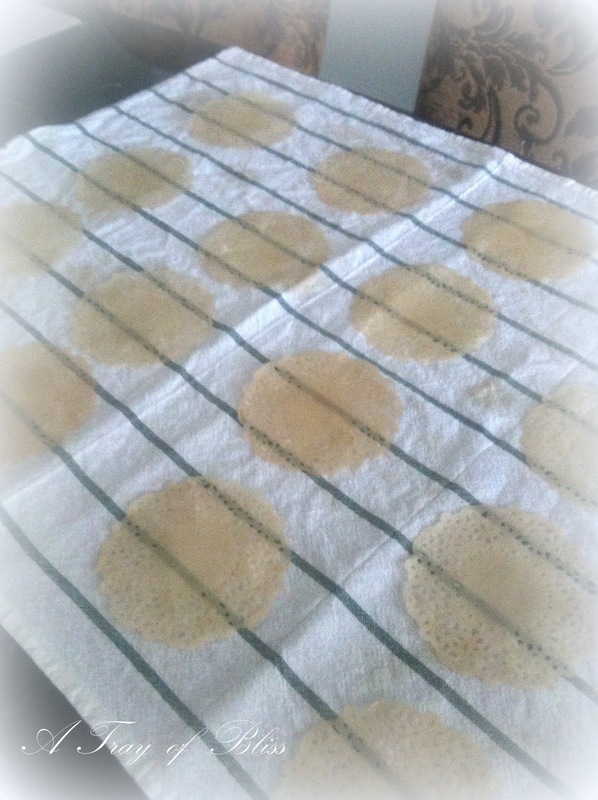 Into the tea solution went the doilies, one by one, immersing them just so they coloured, then carefully removing them to a teatowel on the table, to dry out. Again they will be fragile so gently does it. I also printed off a sweet image of a ballerina on a sheet music background that we really liked. Each tag was started by stamping the French script as a background. Then a bit of tea dyed doyley like a scrap of lace would be added, with other papers or embellishments layered until we were pleased with the result. Some images or shapes, were then edged with pearl paint. A frill of tulle or hand dyed crepe paper finished the bottom edges, and these were then dipped in glue and glitter to frost the edges prettily. Diamante dots were applied to disguise joins, ribbons added to the little holes, and we were done. Each tag takes mere minutes once you have all your materials at hand, and my daughter and I made 30 in about half an hour. These will be gifted 15 in a bunch, along with hand scribed lengths of Butchers Paper saying 'Joyeux Noel', and 'Merry Christmas'. Swathes of calico, muslin or pastel printed fabric will be included as gift ribbon. This is an idea I got from Annabel as well, that really makes this style of gift wrapping look very special indeed. Annabel uses old recycled sheets and stamps them with glittered chandeliers and crowns. Just gorgeous. You can see those here. These are always welcomed as gifts in themselves, and you will not believe how many of my friends ask for these 'gift wrapping packages' each year. You can customise them according to the occasion or season, and the recipients style or preferences. These are particularly pretty I think. How gorgeous, Mimi. I already have the luggage labels, bridal tulle, ribbon and paper doileys. Now to just put it all together when I get a chance. Mimi, how pretty ... and inspiring! What a lovely idea! Your friends must be delighted to receive gift wrapping packages - I know I would be! These are absolutely lovely. I agree with Debbie, if I received a gift with these lovely tags, I would cherish it. Delightful! Always an inspiration! And what a great idea to gift wrapping and tags. Not to mention spending creative time with your daughter. Good memories and good insourcing gifts! 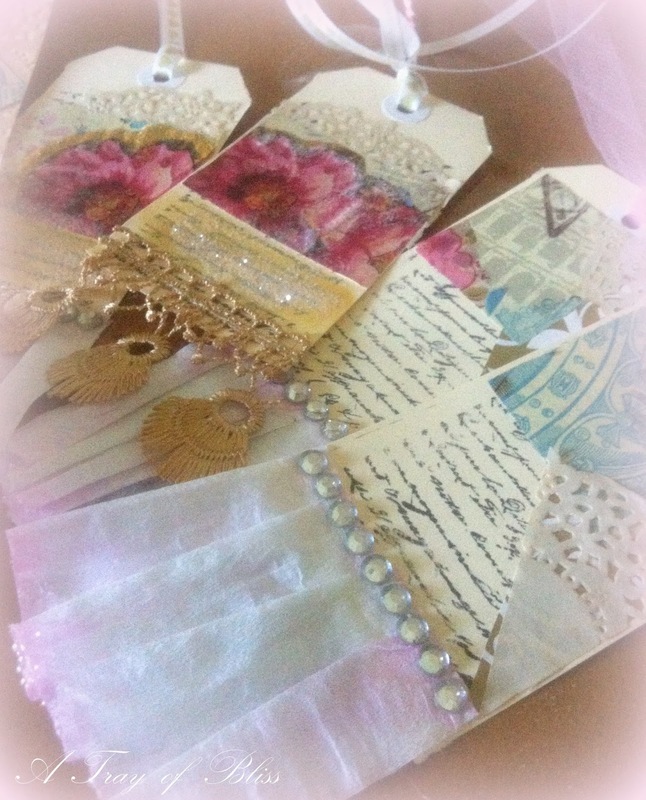 So pretty and thoughtful, and practical as they would make great bookmarks as well. These are really unique and pretty! I have a family member who always spent more on the wrappings than the gifts and every Christmas it was so much fun and mysterious trying to figure out what was in those beautiful packages. I admire all the time and effort you put into making your gifts special. Thank you for sharing. These are gorgeous! Such a wonderful job, not only for tags but could be used for Christmas ornaments as well! What beautiful gift tags, Mimi. I have all the supplies on hand already - a low cost gift tag that looks a million dollars. I've Pinned for future reference and would love you to add this idea to the Ongoing Gift Wrapping link party at Threading My Way.